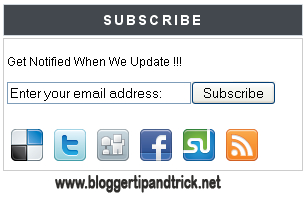 In this tutorials,I will explain to you how create a Subscribe Box with Feedburner Email subscription,Feed subscription and Social networking buttons(Digg,Twitter,Facebook,Stumbleupon,Delicious).You can easily add or remove social buttons to this widget and setup your email subscription.If you like to add this widget to your blog or a website,then follow the steps given below. 1.Log in to your dashboard--> Design- ->Page Elements. FEEDBURNER-ID with your feedburner ID. DELICIOUS-USERNAME with your delicious username. TWITTER-USERNAME with your twitter username. FACEBOOK-USERNAME with your facebook username. STUMBLEUPON-USERNAME with your stumbleupon username. Look at the example given below. i'm having this error. "The feed does not have subscriptions by email enabled"
you have to enable email feed subscription before use this code.